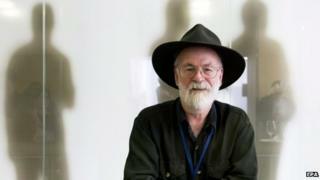 A long-running tribute to late fantasy author Sir Terry Pratchett is being staged with the help of some of the web's servers. Many administrators have added an entry to the text sent to every visitor that includes the writer's name. Instructions about how to include it in software for more than a dozen server operating systems are being shared widely online. The tribute is inspired by a scene in one of the late writer's books. In the Discworld novel Going Postal, Sir Terry, who died aged 66 on Thursday, wrote about the way that the murder of an operator of a semaphore tower, John Dearheart, was marked by his colleagues. His name was included in admin messages (known as overhead) sent around the semaphore or "clacks", network prefixed with three control characters, GNU, that kept it circulating forever. In a similar way, many net server and website administrators are adding the text "X-Clacks-Overhead: GNU Terry Pratchett" to the headers their machines share with every computer that requests web pages from them. Headers give web-browsing programs valuable information about the data they are about to be sent but are generally not seen when people visit a site. An extension for the Chrome browser has been made that can spot when people visit a site taking part in the tribute. The idea to mimic the Discworld tribute was first floated on social news site Reddit, which has acted as a hub for supporters of the idea. There is also now a subreddit dedicated to gathering information about it. Instructions of how to include it in the most popular operating systems for web servers are now available. "His name will live on for a long time, buried in the code of the very internet itself," wrote Adrian Kennard, founder and managing director of ISP Andrews and Arnold, in a blog about the tribute. "There is no harm, or waste in it being this string - so why not?"